iBid was designed with charities in mind. iBid has simplified the way charities connect with their donors. With iBid, mobile bidding is now more affordable and user friendly than ever before. Get the service you need at a cost you can afford! 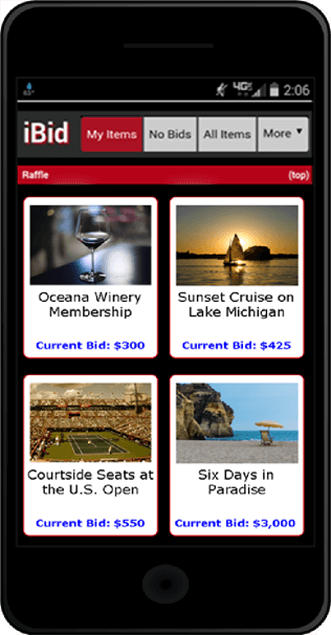 Text or E-mail your guests updates about the auction and event. No need to have guests check in, everything they need to know is right on their phones. Bidders can create a watch list and view a record of their bidding history. Choose your own colors, include a logo and message, even upload scrolling sponsor images. Guests control their own information. Once you email them an invitation, they will provide you with the rest. When a bidder is outbid on an item they instantly receive a text message that prompts them to raise their bid. After the auction closes guest will receive a text message providing a link to their receipt, streamlining the check out process. Allow for easy item pickup and both proof of item receipt and payment verification with a signature on a touchscreen device. We’ve Done the Work So You Don’t Have To. 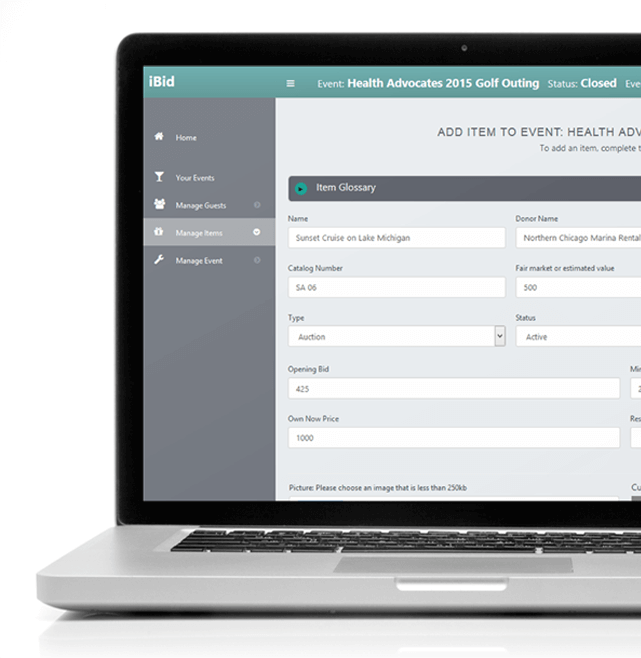 iBid increases your independence to help cut the costly expense of event support. Guests use their phones to check in and confirm their donations. This eliminates the need for long lines. Mobile bidding leads to more overall bids. Each guests next bid is just a click away whether they’re at dinner or on the golfing green. With iBid your guests can bid from anywhere. Start your auction early to help give your proceeds a boost. Even guest who can’t make it to the event can still participate. Don’t let the cost of an auction service get between you and your event’s proceeds. We designed iBid to increase your independence and increase bidder activity to ultimately offset our cost. When you start an event with iBid you are not alone. iBid is designed to minimize the need for external support but we’re always ready for your questions when you need us. No need for a major investment before you know your proceeds. Our cost is based on your success, which makes us invested in your cause. "When we started using iBid our proceeds increased from the previous year. It was easy for us to set up and even easier for our guests to use!" "We have been using iBid since 2008. Our proceeds have increased year over year, and our guests love it"
"iBid is very easy to manage and run. Our guests love the ease of use and the simplicity!" "Without iBid Mobile Bidding our auction couldn't have succeeded. As an all day long event, early attendees would be squeezed from bidding by those attending at the end. iBid makes it possible for families with all aged players to bid on our auction items." "Loved checking in and starting to bid while riding in the Uber on the way to the event! Slick, Modern, Convenient. And no checkout lines at the end… ah, thank you, iBid"